The Body Shop are regularly releasing new products and new ranges, a few of which I've been using over the last few weeks. I love it when brands do this because it keeps thing fresh, exciting and interesting. This is a limited edition collection, which consists of a shower gel, body butter, lotion, scrub, massage oil, bath bombs and eau de toilette. The products contain real, hand picked poppies from Ankara in Turkey, with The Body Shop describing the final scent as seductive and euphoric. This is definitely one for those who like their scents strong and intense; it's quite dark and masculine, which I think is also captured perfectly in the shiny black packaging. At first I wasn't sure, but the more I smelt it, the more I liked it - at first it can be a bit overwhelming, but once it settles onto your skin it really is beautiful; a woody floral with a big dollop of spice. In my opinion, this is The Body Shop's best formula; real poppy seeds are blended into a thick cream, which leaves the skin soft as well as exfoliated (I'm not too keen on their jam like scrub). Although I don't like using manual exfoliators on my face as I find them too harsh, but when it comes to the body the grainier the better! You can really feel the poppy seeds working on your skin, without any kind of irritation or discomfort. Plus I love how the smoky poppy scent lingers long after getting out of the shower. The Smoky Poppy Body Lotion comes with a handy pump dispenser for easy application. This is probably my least favourite product of the bunch though; as the lotion itself is quite light and thin in consistency, I don't really feel like it makes enough of a difference to the softness and moisture level of my skin. I think I'll return to it in the summer when the weather isn't so cold, as it may be more suitable then. This is the first eau de toilette I've tried from The Body Shop and I'm really impressed! I could still smell Smoky Poppy on my wrist after 8 hours of wear. Whether this is just down to the intensity and depth of this specific scent I don't know, but if the other scents last just as long I'll definitely be picking up a few more, because £8.50 is a bargain. I have been wearing this in the day because the scent does become softer after application, but it would really work as an evening perfume too. The Drops of Youth range is designed to tackle the first signs of ageing and includes four products; Wonderblur, Face Concentrate, Eye Concentrate and Bouncy Sleeping Mask. As I've only been using this a few weeks, these are my first impressions of the Bouncy Sleeping Mask rather than a full review. Containing Edelweiss Stem Cells, this mask should be left on overnight to "leave skin looking bouncier and feeling replenished". I haven't used anything quite like this before; the formula is like a thick but creamy gel - nudge it with your finger and it just dents, then bounces back into place. A bit like memory foam! This is why a spatula is provided in the box, because otherwise it's really difficult to get out of the pot and mostly ends up stuck in your nails. As this contains silicone, I was worried it might be too slippy and feel more like a primer on the skin. However thankfully it feels more like a moisturiser, which you massage in as normal and leave to absorb (it is a little tacky to begin with). The next day I can see a real difference in my skin - it looks brighter, plumper and calmer; any redness I have is reduced and smoothed out. I like this a lot and plan to continue using it a couple of times a week when my skin needs a boost. 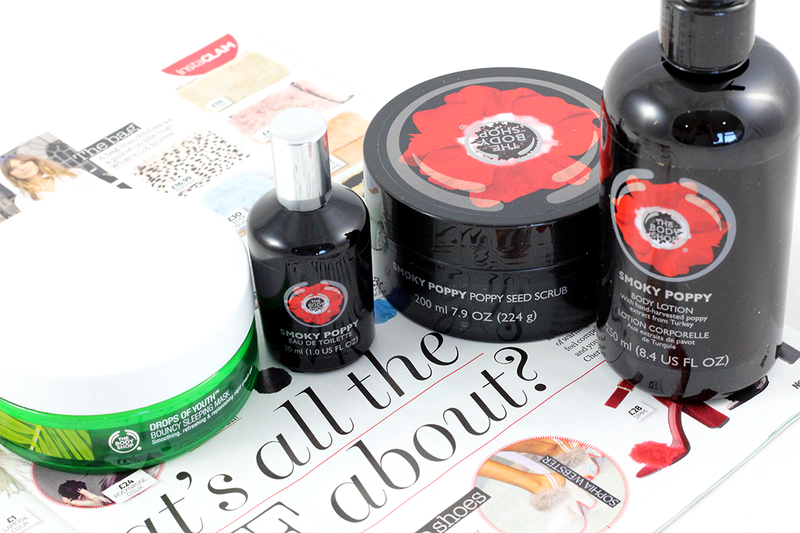 Have you tried any products from the Smoky Poppy or Drops of Youth ranges? Are there any others you'd recommend? I was SO tempted to buy the Drops Of Youth the other week. Think it may leap frog up my wish list now for when I'm next paid! I adore poppies as a flower, so actually being able to buy in a product is my heaven! Amazing amazing products. Want to try them all. That scrub sounds especially lovely, would be interested in giving it a whirl!